Around early September 2006, Islamic classes for non-Muslims are coming of a Caucasian girl with blue eyes. Sitting in one corner of the room with a keen eye, barely kerkedip and even showed an inside edge. Several times I have presented lolucen in that class, nor make it smile. When the question and answer session began, the girl raised her hand, and without smiling posed questions that make some participants dropped, and some even thought that I would be offended by these questions. "If Muhammad is a true prophet, then why he robbed and killed? ", He asked in a voice soft but firm. "Why he forced the Jews to leave Their homes, while They have been settled in Medina a long time before Muhammad was born? ", He added. Smiling, I asked, "Where did you get this information? I mean, the which book did you read ". He then showed he was carrying several books, including some writings / articles taken from various sources on the internet. I asked for some books and articles, but I just do not respond to his questions. I asked, "Where are you from and where do you live?". Turns out he was an Iowa girl currently living in Connecticut. As I introduce myself further I noticed that "honesty" and "intelligentsia" girl. Although it still can not show the face of friendship, but it seems he is the girl is. He was a "scientist" who works at one research institution in New York. But he said again, and this is where the new seems a little smile, "I am an IOWAN girl". When I asked what he meant, he replied: "a very country girl". Hence indeed the situation does not allow for me to argue with him directly regarding questions that are thrown, I propose that the questions sent to me via email, to selanjuntnya can discuss via email and also at the next meeting. Evening classes and even then disbanded, but the questions this Iowa girl kept tickling my mind. At night, I open the email before going to bed as usual. This Iowa girl was fulfilling my request. She introduced herself as Amanda. He sent an email with attachment 4 page full of questions-khususunya - about the Prophet Muhammad. I once again did not answer these questions, but invited to come to class on the following Saturday Islamic. It turns out, perhaps he himself realized that some participants frum on Saturday was less comfortable with the questions that are considered too "plain and sharp." So he suggested that I could provide a special time for him to discussion. I then accepted the proposal to discuss with him every Thursday afternoon after working hours at the Islamic Center. We also agreed to meet every day 5:30 until 7:00 pm. One and a half hour in my opinion enough to discuss dengannnya. Unexpectedly, it turns out the month of Ramadan has arrived. Then the arrival of the first to dialogue with me happened on the third Thursday in September 2006, when we were preparing for iftar. He came, as usual with a hooded potluck, but this time with a very polite, though still with a look that seemed suspicious. We begin our discussion with questions that have been emailed it. Apparently, just one issue under discussion, occasionally interspersed with a bit of an emotional debate. Athan has been echoed iftar. So I politely ask permission to Amanda for breaking the fast, but do not forget to offer if you want to join me. Apparently, Amanda pleased to join the evening meal (go go) and seemed to enjoy the dish. After breaking the fast, because they have to fill the lecture, I have to say to Amanda that our discussion will be continued next Thursday. But if it is still pleasing present, I came to Frum mempesilahkan Saturday. He promised to come. The next Saturday, he came up with a more friendly face. Sitting seems quieter, but still heavy as to smile. In fact, my discussion is sometimes filled with a joke. Known, but it is intended not to present Islam with "rigid" I want to convey to them that the Muslims were also the same as other humans, can joke (good), smiled, and so on. Amanda seems serious attention to all the points that I mentioned that day. Incidentally we are discussing the creation of Eve in the context of the Qur'an. The point is to explain how the process of creation of Eve in the prospective of history, and also how the Quran puts Eve in the context of "gender" lively debate today. Amanda seriousness of this almost makes me suspect that he was looking for loopholes to submit questions that attack. It turned out that my suspicion was wrong. Amanda is now before delivering precisely the question to ask, "Is it ok to ask this question?". Usually I have to say emphatically, "Nothing is to be hesitant to ask on any thing or any issue in Islam. You may ask any issue range from theological issues up to the social ones ". Amanda was asked several questions about women, but this time with courtesy. Hijab, polygamy, the concept of "power" (he meant was qawwamah), etc.. I almost do not believe, how she understood it all. And sometimes in delivering these questions with evidence obtained from the books - which is precisely - written by previous scholars. I tried to answer all of them with arguments "aqliyah", because I saw Amanda is a very rational person. Thank God, I do not know whether he was satisfied or not, but they certainly seem Amanda nodding his head. Similarly, several meetings. Until came the day of Eid. Amanda when I was invited to attend "Open House" at the house a few RI officials in New York City. Because he was still working, he had only come to the residence of Deputy Ambassador to the UN. It was there, while enjoying the foods of Indonesia, Amanda re asking sharp questions. "If Islam respects religious freedom, why Ahmadiyya in Indonesia is banned? Why Lia Aminuddin is arrested? ". I was surprised to precisely convey information Amanda. I personally do not read much about this, and not too concerned. So I explained, in all States of course there are rules that need to be adhered to. Ahmadiyah and Lia Aminuddian, obviously me, not establishing a new religion but to distort Islam. Because they are destroying religion is believed by many Muslim societies, governments need to curb this. Apparently my explanation is less satisfactory, but the discussion changed direction kekudian to bihalal halal food and tradition. Speedy story, some Sunday and then she sends an email with the sound as follows, "I think I start having my faith in Islam". I just said, "All is in God's hands and yours. I am here to assist you to find the truth That you are looking for ". Just, Amanda says that his journey to learn about Islam it will take a long time. "When I do some thing, I do it with a commitment. 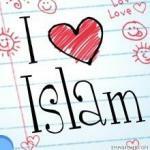 And I truly want to know Islam. " I just answered, "Take you time, Amanda." Alhamdulillah, after nearly seven months studying Islam, and after reading the various references, including commentary Fii Zilalil Quran (English version) and Tafhimul Qur'an (Classic), and several books of hadith, Amanda began seriously studying Islam. Last week, he sent an email to me. It contained this: "I have decided a very big decision .. and I think you know what I mean. I am very scared now. Do you have some words of wisdoms? ". I replied, "Amanda, you have searched it, and now you found it. Why you have to be scared?. You believe in God, and God is there to take your hands. Be confident in what you believe in ". Three days ago, she sent back to his email and said that he intends to formally say "syahahat" on next Monday (March 5, 2007 yesterday). I ask, why not Saturday or Sunday so a lot of friends who can follow? He replied that some of his closest friends just had time on Monday. Thank God, witnessed by about 10 close friends Amanda (including non-Muslims), just after the Maghrib prayer he guided me melafazkan "Ash-hadu laa ilaha illa Allah an-wa anna Muhammadan Rasul Allah ASYHADU", accompanied by shouted Takbir and some of her friends drop tears that attended. Amandapun first as Muslims perform afternoon prayers were followed by joint prayer may God strengthen his way toward the Divine blessing.